Apparently, Adams meant this as a joke, but 42 isn’t just any ole number. It actually has great significance … and, coincidentally enough, it’s the same number of years that, as of today, I have been alive. By extension of logic (maybe), I’m choosing to believe that my birthday, the oft–referred to “day of all days,” is everything. It’s the answer. So now, simply by virtue of turning 42 years old, I am in possession of the meaning of life. How cool! What a great gift that is. If there’s one thing I’ve gotten good at over these past 42 years, it’s doing just that. And over the course of my last lap around the trail of life, there was lots of good time to enjoy. There were trips to Colorado, Chicago, Cleveland, Las Vegas, Florida, and of course, New York. There were dates. There were good movies. There was lots of good music. We celebrated family milestones like my dad’s 70th birthday and my nephews’ 5th. I made some strong relationships even stronger (online and off). My employer was acquired. I ran (some of) my first 5K. And, most recently, I had a great time at my 20-year college reunion. Yes, 41 was a great year to enjoy the passage of time. Looking back on it makes me happy (as it should, apparently), and makes me feel tremendously lucky. At 42, I’m not married or a parent or a community leader or a director or VP at work, and there’s still plenty I want to do with my life. But as I’ve said before, perspective is important. I know I’m doing better than I think I am and I still have plenty of time left. But wait a second. Where does that leave me with understanding the secret and meaning of life? I’m confused. 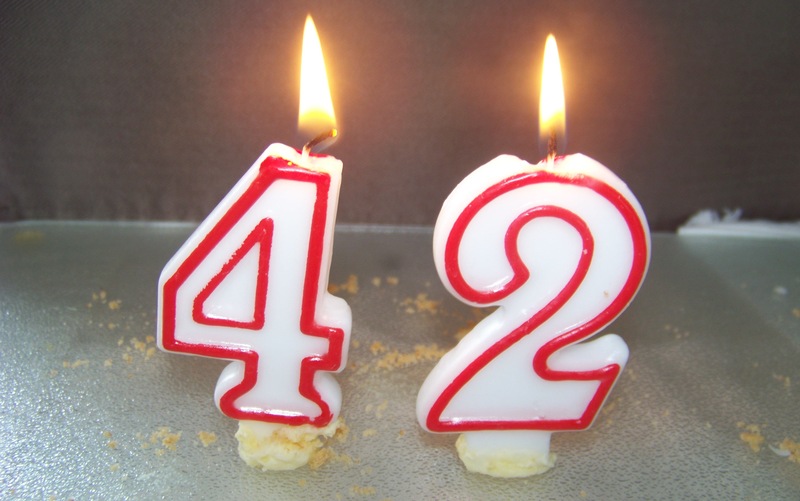 So, as I begin my “42” year, I’ll have to split the difference: I hope the next 12 months will be everything — but regardless, I’m just going to enjoy the ride. Want to help me celebrate? Leave a comment below, or tweet this blog post. ← When Is a College Reunion Not a College Reunion? Always look forward to your birthday blog!!! Hope you have a great day!